With a roaring crowd filling the bleachers, No. 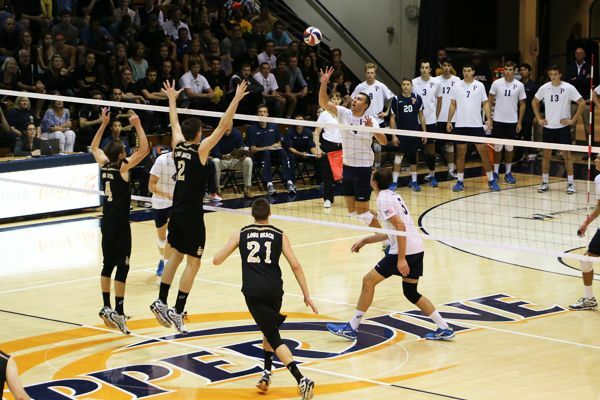 2 Pepperdine men’s volleyball beat No. 7 Long Beach State in the MPSF Quarterfinals, 3-1, on April 19 in Firestone Fieldhouse. Senior Kyle Gerrans finished with a team-high 17 kills. Junior Josh Taylor and sophomore Matt Tarantino followed close behind 14 and 10, respectively. Junior Matt West nailed a team-high three service aces. Next, the Waves continue their post-season run, as they face No. 3-ranked Stanford on Thursday, April 24 at 4 p.m. in the MPSF Semifinals in Provo, Utah. The team hits the road on April 23, according to Taylor.